Fancy Pants Designs is having our FIRST EVER public Warehouse Sale!!! We are so excited to offer this to our local Fancy Pants Designs Fans! Here is the scoop! We hope everyone had a great Memorial Day!! 1. Cover Say It Simple Chipboard letters (#770) with wet adhesive and generously sprinkle glitter over top. Tap off excess glitter and set aside to dry. 2. Cut 9 triangular shapes(approximately 3.5 inch sides) from Devoted paper (#760) and ink edges light brown. 3. Adhere triangles to vintage music sheets or book pages and trim with decorative scissors. Ink edges light brown. 4. Punch holes in top corners of triangles and link together using various scraps of Fancy Pants ribbons. 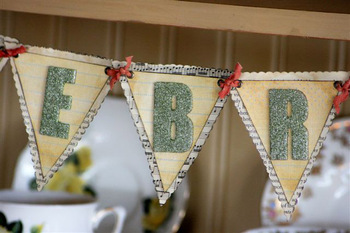 5.Adhere Say It Simple Chipboard letters(#770) to the banner and hang for any celebration! Thanks for sharing your incredible talents with us Amber!! REMINDER!!! YOU STILL HAVE TIME TO ENTER OUR CARD CONTEST!!! ENTRIES MUST BE EMAILED TO megan@fancypantsdesigns.com BY MIDNIGHT OF THURSDAY MAY 29!! Hi everyone!! Sorry about the delay!! This project was definitely worth waiting for!! 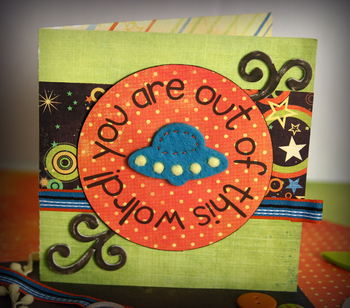 The super creative and talented Jeri Hoag created this super cute card below! 1. Using a Word processing program create "you are out of this world" in a circle. Print on Rockin #635 paper. Then cut it into a circular shape. Ink edges and lay aside. Pick out your favorite Fancy Pants swirl chipboard and cut to size. Ink swirls and lay aside. 2. Use the other side of Rockin paper and cut a strip of paper about 2 1/2" x 6". Also cut a sheet of Wild Child #639 in half to 6" x 12". Fold in half with the green side facing out. 3. Add strip of paper to the front of the card. Also add a piece of ribbon from the About a Boy ribbon card #705. 4. Add hand stitching and pom poms cut from the Celebrate ribbon card #704 to felt shaped UFO from the Rough & Tough Fashion Sense #695. 5. Adhere your circle with pop-dots. 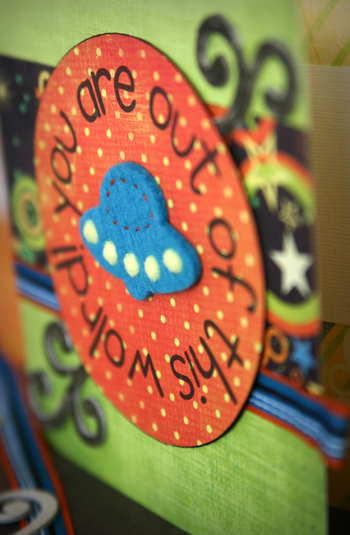 Adhere the UFO felt piece and finally the chipboard swirls to finish it off. Thanks Jeri!!! We absolutely LOVE this card!! This time of year seems like the peek card giving time!! :) With so many weddings, baby showers, graduations, birthdays, etc., it seems you can never have too many homemade cards on hand!! SO...with that being said... ITS A CARD CHALLENGE!! Email your any themed card(s) using Fancy Pants Product (of course) to megan@fancypantsdesigns.com by midnight on May29th! Winners will be posted shortly after, and will each receive a fantastic Fancy Pants prize package!! Megan...(our head FP blogger) was out of the office today...so look forward to a new post on Wednesday when she returns! Just wanted to let you know that we haven't forgotten our weekly project and we are sorry for the delay :P!!! Hey everyone!! We hope you all had a TERRIFIC Mothers Day!?! Here is our weekly project number 2!! 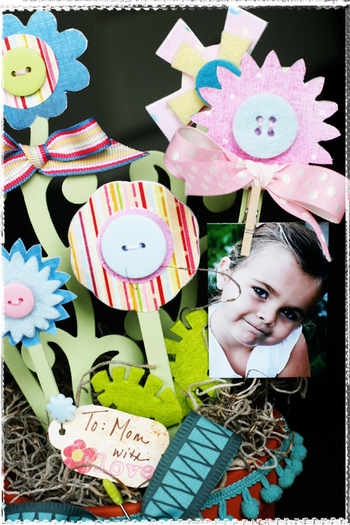 This super cute altered item is from the extremely creative Allison Davis! 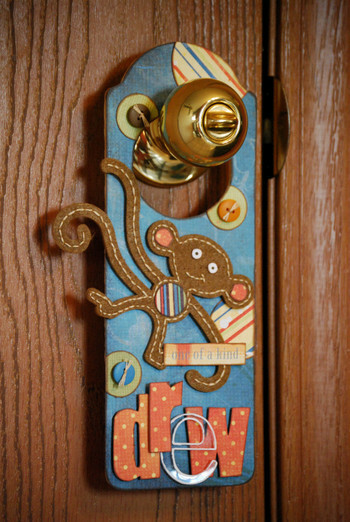 What a fun idea for your kids doors!! 1. 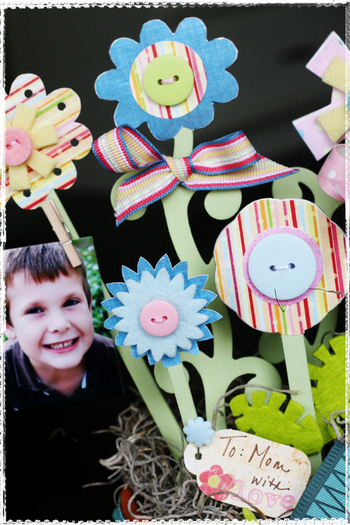 First I covered a wooden door hanger with papers from the About A Boy collection. 2. To complete the felt monkey I used a circle punch for the tummy and then hand drew and cut out the ears. Then I used embroidery floss to stitch around the body and to create the monkey's mouth. 3. Next I covered the chipboard letters with paper and traced around the clear "e" with a paint pen. 4. The last step was adding the buttons to the three green circles and the die cut "one of a kind" to the monkey's arm. Thanks Allison for sharing your cute ideas with all of us!!! I think it is about time for a challenge.... check back for details coming later this week!! Each Monday, starting TODAY, we will be posting fabulous projects- along with simple instructions!! This way, when you see these great ideas, you will know where to start, and how to create them for yourselves!! We are so excited about this new addition to our blog, and hope that you will for sure check us out each Monday for the next couple of months!! Today, the incredible Greta Hammond has created a MOTHERS DAY BOUQUET, with flowers that won't wilt!! :) Thanks Greta for this wonderful idea! 1. Using the Power Flowerz chipboard as a base, I then painted the stems and decorated the flowers with paper, buttons, and felt. 2. I took an ordinary small flower pot with a styrofoam insert and began sticking the flowers into the base. 3. I added close pins to a couple of the flower stems to hold small pictures. 4. To finish off the display, I added some ribbon around the flower pot, some ribbon bows here and there and a tag with a stick pin. Get to work!! 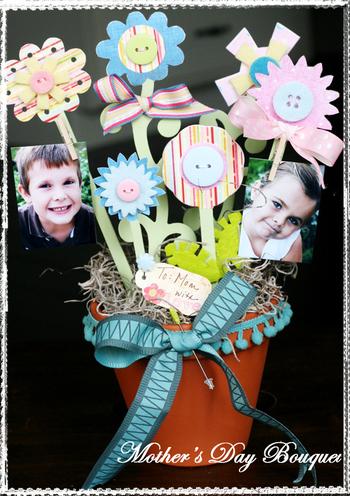 You still have time to create this darling flower bouquet for a uniquely perfect Mothers Day Gift! !